They may look like little fluffy cotton balls with legs, but the damage mealybugs can do on houseplants and in the outdoor garden is serious. 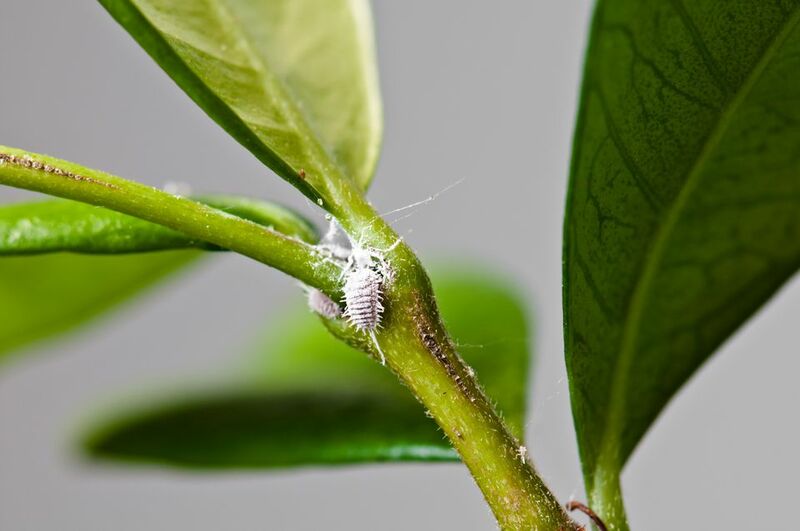 Mealybugs, a cousin to other garden pests like scale and whiteflies, can damage many flowering and ornamental plants by direct feeding and by introducing diseases into the garden. Organic gardeners can control this pest in several ways without resorting to toxic pesticides. Mealybugs are tiny insects, about 1/8 inch in length, but their color and clustering habit make mealybugs easy to find on garden plants. Most common mealybug species are white, and have waxy looking filaments covering their bodies, giving them a fuzzy or hairy appearance. An exception is the hibiscus mealybug, which is pinkish-brown and lacks the fringe. What plants to mealybugs like to feed on? Many of our favorite houseplants are susceptible to mealybug infestations, including gardenias, jade plants, ficus trees, English ivy, hoya, and palms. In the outdoor garden, watch for mealybugs on coleus, begonias, Gerbera daisies, marigolds, and chrysanthemums. Any plant that has experienced high nitrogen levels from over-fertilization will be especially appealing to the pests. You can manage small mealybug infestations with a simple blast of water. Use a plain jet of water to disrupt the bugs' feeding, and spray plants with neem oil to discourage the bugs from coming back. Neem oil spray will not affect bees, making it ideal for the pollinator-friendly landscape.